The post Feni – the friendly Goan spirit that stinks a bit. appeared first on Goa Waves. Coconut feni is distilled all year round. It comes from toddy (a sap) collected from the coconut palm. Toddy is collected in earthen pots by tapping the buds or the palm tree flowers. The pot are fastened to the tree overnight and brought down in the morning. You can taste the sweetness of the toddy if consumed immediately. I remember when I was younger on our holidays we used to buy a 5 litre gallon of toddy. I used to have around 3 glasses – Yum. The sweetness disappears as the juice gets fermented and froth forms on the top. Then it tastes vinegary. The toddy is taken to the distillery for further fermentation and vaporizing. This finally produces a colourless and odourless drink. Coconut feni contains approx 42% alcohol and can be purchased everywhere in Goa. It is only distilled in South Goa. It can be drunk neat or on the rocks, but in restaurants you are likely to be offered Coke or Limca to mix with it. Cashew Feni comes from the cashew fruits which ripens March to May. Cashew is a two part fruit :- the acidy seed (the Cashew nut) and the juicy pulpy fruit. The seed is twisted from the fruit to separate it. The feni is made from the juice. When the ripened cashew falls from the tree it is taken to the factory where it’s stamped on to extract the juice. Fresh cashew juice is known as “Neero” (neat) and can be drunk. But it tends to make your mouth dry and leave an itchy sensation in the throat. After fermenting, the first distilled extract of the Neero is known as Urrak (Urak). This is considered as light drink – around 10 to 15% alcohol. It’s cloudy looking. Most Goan restaurants don’t serve Urrak, however, we’ve noticed recently a few of them advertising it on their boards. Proper Goan’s have a generous quantity of Urrak with a squeeze of lime. In restaurants Urrak is more likely to be served with Lemonade or Limca or Soda. The re-distillation of Urrak is known as Cazulo. This is a mixture of Neero and Urrak which contains around 30 to 40% alcohol. Cazulo is a colourless clear drink. The final distill is Feni. A good strong Feni is distilled from the mixture of Urrak and Cazulo. It is colourless and contains around 45% alcohol. As in my childhood memories, cashew feni has a very distinctive aroma. It pongs. Feni is sold all over Goa and served in most restaurants. As home distilling is illegal, homemade feni doesn’t exist … But if it did, it would definitely cost less than Rs.200 for a 1 litre bottle and would be the smoothest available (shhh.. Mum’s the word). As for drinking it, my preference is to add twist tonic water to disguise the aroma. Like wine, the taste of cashew feni varies depending on the cashew type and location. Be warned that it is deceptively easy to drink and you could be in for a shock when you stand-up. That said we thoroughly recommend trying this unique and inexpensive local spirit. If you do – be brave and go for the cashew version… and don’t call us if you can’t find your way home. The post The Weather in Goa in December appeared first on Goa Waves. A question frequently asked on travel forums is what's Goa like in such and such month. We thought we would answer this on a month by month basis. For most, the weather just doesn't get much better than Goa in December. It's comfortably cool in the early morning and late evening with a temperature of 16°C . In the day you can enjoy up to 11 hours of clear skies and sunshine with temperatures going to 32°C. Yes it's hot, but the gentle sea breeze makes it very pleasant indeed. Due to the Great weather December is a popular month for weddings in Goa. It is also the peak tourist season and is lively with the locals celebrating Christmas. For those looking to escape the anxiety of a Westerner's Christmas (that'll be me!) don't worry you will only really notice Christmas if you look for it. The light in Goa is beautiful and in December the beaches look at their whitest and the sea at its deepest blue. Goa has a tropical climate, however humidity is at it's lowest in December and January. Another bonus is that December is the start of 4 month period without rain so Goa is still lush with greenery from the previous monsoon season. It is possible to catch the last drops of the rain at the beginning of December, but nothing more than quick shower. The sun rises at approximately 6:45 and sets over the Arabian sea at around 18:00. The sea temperature is 28.2°C which is great for swimming and paddling. You do have to be careful of undercurrents, but lifeguards are many and the water is largely calm . Wind speeds are at the lowest in December, but there's enough breeze and heat to completely dry any wet swimwear in 20 mins. In terms of accommodation, your experience will greatly depend on the nature of the building and its position to the sun. However, with the cool evenings air conditioned accommodation is often not needed. In our shaded apartment we feel more comfortable in December wearing a fleece until later in the morning. Goa in December and January is perfect for the weather, but if you are on a tight budget or like more solitude November, February, March and April may suit you better. DO YOU HAVE EXPERIENCE OF GOA IN DECEMBER? As always, we would love to hear of your thoughts or experiences. The post 10 Scams to Avoid in Goa appeared first on Goa Waves. Anyone remember 'Peckham Spring Water' from the BBC comedy "Only Fools and Horses"? Well, India were ahead of the game. Just check the seal is unbroken on any water you buy from street sellers and train stations. The local Dell Boy could give you "Dehli Belly" if you are not careful. There are well treated temple elephants in Goa. Also there are some "holy men" (Sadhus) who operate in Calangute and Candolim for their own gain. They say the elephant can remove sins and will encourage posing with it before hassling for a very large "donation". The mistreatment of these elephants is well known and locals will often warn you, but it continues. Not having change is often genuine in Goa. In fact don't be surprised if you are given boiled sweets in supermarkets instead of small change. Just make sure you carry change. Almost certainly you will not get anything back from a rickshaw driver. Be extra careful when you are buying wrapped gifts to take home. That lovely box of saffron might turn out to be finely shredded orange paper. This may not be common, but we were caught out with a "special deal" which promised automatic future credit. Where possible check on-line to see what providers are changing presently before topping up. 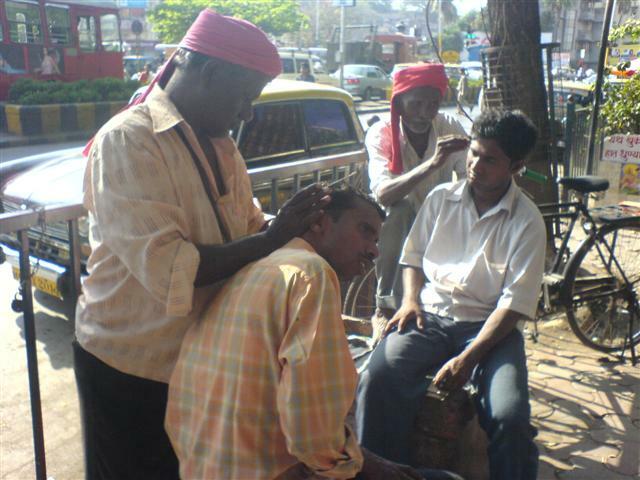 Ear cleaning is a genuine roadside service in India, but in tourist Goa you are unlikely to get the real deal. The scammer's trick is to get to your ear before you know what's happening and exact some pre-prepared gunk . Do take a look at the ID card they will show you. In my case it said the Ear cleaner had mental health issues, but others report amusing spelling mistakes like confusing "Microscope" for "Horoscope". It's common in Asia for shops to pay a commission to those who bring in customers. It's not a scam itself, but the pay tends to be better at the shops who specialise in over charging gullible tourists. Even government supported tours who offer shopping for Goa's famous tax free spirits take tourists (usually domestic) to one overpriced shop. Watch out for the airport baggage carriers who like to help you get your suitcases of the carousel for you or those who want a few pounds (rather than RS 20) for carrying bags a few yards. Watch out for the toilet cleaners who collects one pound coins. More recently my Indian brother-in-law was charge import tax on the jeans he was wearing! Although there are occasional variations, beach sellers are generally men selling pirate DVD's and women selling clothing. It's an illegal and is an expensive way to get goods. Watch how a group of sarong sellers will sit around a lone female tourist on the beach until she either buys or leaves out of discomfort. It's time tourists stop buying from those without a licence. This has to be the mother of all scams. Unless you are Indian (or are an Original Citizen of India) our advice is simply don't get lured into thinking you can own property in Goa. If you are still not convinced read this personal account or this UK newspaper report. HAVE YOU BEEN SCAMMED IN GOA? The post How Much Should I Tip in Goa? appeared first on Goa Waves. How much and who to tip is a personal decision. We don't always agree on this one ourselves, but there is some broad consensus on what may be appropriate in Goa. The term 'Baksheesh' (a middle eastern word) is often used for tipping. However, it is viewed more as a gift rather than a gratuity which is why you may hear beggars crying 'baksheesh, baba!'. Some Indians tip in advance to secure a good service. It does not cause offence as little "gifts" are very much a part how things get done in India. Indians are often very good tippers. Accustomed to the hierarchies in Indian society, middle classes Indians may appear more exacting and off-handed with service workers (compared to apologetic Brits), but they have pride and like to show they can afford to tip. Larger restaurants and coffee houses with an annual turnover of RS, 800,000 (should) pay a 12% service charge to the government. If a service charge is shown on your bill no tip is expected. A small gesture like " keep the change" may be appreciated, but not always accepted. For example, we used to visit a coffee shop in Margao city which was part of a well known chain. The young Goan women there constantly went out of their way, but would never consider a tip. Don't forget that many workers in the tourist parts of Goa are migrants trying to earn as much as they can in the season. They may have different motivation to regular Goans. In most other restaurants and beach shacks a decent amount to tip for good service is 10% of bill. In most cases tips get shared amongst staff, but you could ask. Of course, if you are staying in Goa long term and have your regular eating places you may be more inclined to leave RS.20 -30 for good will. Taxi and autorickshaw drivers will not expect a tip. Autorickshaws are metered, but rarely do they work to them when it comes to visitors. In most cases drivers will aim for highest price they think you will pay. Sometimes even renegotiating as you walk. If you have hired a driver for a longer period, particular through an agent, you may wish consider giving something for good service. Generally the price you are given will include the driver's meal, but occasionally you may need to give Rs. 100 for this. We tend to take the mobile number of a reliable autorickshaw driver and call them when we have a few jobs to do. To keep the good relationship we would tend to give something over the asking price, but not more than Rs.50. With car hire we may give more, but not more than RS.100. We do this only when we are sure we have been given a fair price in the beginning. Goa also has "pilots" which are motor bike taxis which are not often used by tourist. They will not be expecting tips either. You are not expected to tip guards, doormen, bellboys and housekeepers, but have a few RS.10 or 20 notes handy for those who have gone out of their way. If you find someone lingering expectantly don't cave in as it only perpetuates this practice. Indian's are some of the most hospitable people on the planet so don't let a few mercenary types ruin this. Equally, recognise that service staff are not well paid or given much respect. It's a balancing act - maybe an art. At one of our regular restaurants frequented by loyal westerners there was a terrible argument. The head waiter (and owner) held his cool under attack and after a few tense moments four angry young Punjabi men left the restaurant to everyone's relief. Although visibility shaken our waiter was a hero. He got patted on the back for his handling of the situation and was in for some good tips that evening. My wife saw it differently. Being Indian she understood the earlier conversations and how patient the Punjabi customers were when they received wrong orders and slow service. It was only after another wrong order that they asked for it to be changed and the our waiter rudely refused. He created the tension and was steadfastly unapologetic to the end. Our guess was, that under pressure, our waiter prioritised existing customers over the new, but it showed me how easy it is to misread a situation. DO YOU HAVE ANY EXPERIENCE OF TIPPING IN GOA? Goan chouriços sausages are extremely popular with the Catholic population of Goa. They’re absolutely delicious, but many visitors to Goa don’t know about them. The post The Delicious Goan (Chouriço) Sausage appeared first on Goa Waves. Which are dried in the sun for a minimum of 3 days, but the longer – the longer they can be stored. Our favourites are the 5 inch long saugages which have more masala and less fat, but you can get 1 inch versions which have less masala. Both are actually quite fatty, but all the Catholic Goans I know love pork fat. Is the same as dried, but you guessed it without the drying/preserving process. We have not seen these made larger than an inch. We don’t buy these as they are no good for our relatives who want to transport them on the over night train back to Mumbai. These are mainly fat and skin and are cooked, but not dried. These are also the small size and can be identified by the extra shine on their skin. For me, these are the tastiest sausages ever. They give you a real sense of feeling warmed and satisfied, but you must like your food quite spicy to enjoy these. You will find most Catholic Goan’s who have these sausages in their homes as they make an easy meal for surprise guests. Like regular sausages they just need pan frying and are a tasty meal just served with rice or bread. If you have a few more minutes add onion, tomatoes and boiled rice to make a Goa Sausage Pulao. We prefer them cooked without the rice (as below) and eaten with chipattis. Here’s what Debbie made earlier (see the fat!). The KTC Fish market near the Bus terminal. This takes you a little out of Margao going north, but has a great selection of fish, meat, fruit and vegetable. There are also other shops and banks nearby. Gandhi Market. This is smaller with a mix of everything. It’s more convenient if you are in Margao, but not so good in our view for sausages. In fact you have to go to KTC for large sausages. This is not easy to answer as prices seem to be going up all the time, but recently they were Rs. 500 a kilo for long sausages and Rs.250 for 100 small sausages in Margaon. Goan Sausages at KTC Fish Market Margaon. Have you tried Goan sausages? Do you know other places to buy them? We would love to hear of your thoughts or experiences.